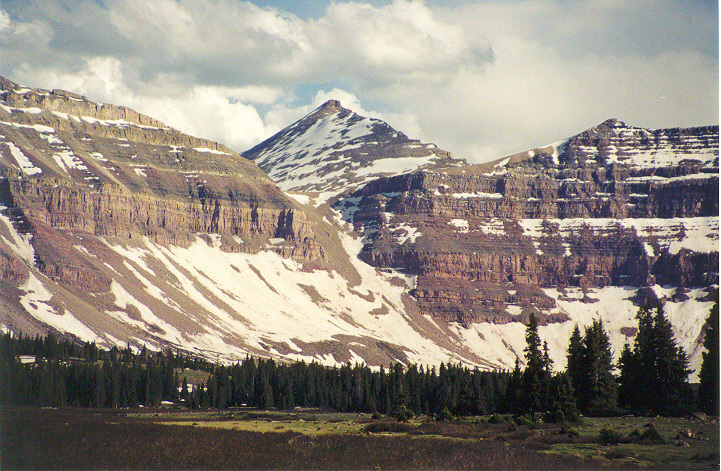 The Uinta Mountains are a very unique range located in the northeastern corner of Utah and they contain all of Utah's high 13,000 foot peaks. Composed mainly of metamorphosed sandstones and shales these mountains have a distinct layering which is clearly seen in the photo above. The real interesting aspect of the Uintas are the fact they are oriented east to west which is different than the majority of the nations ranges. 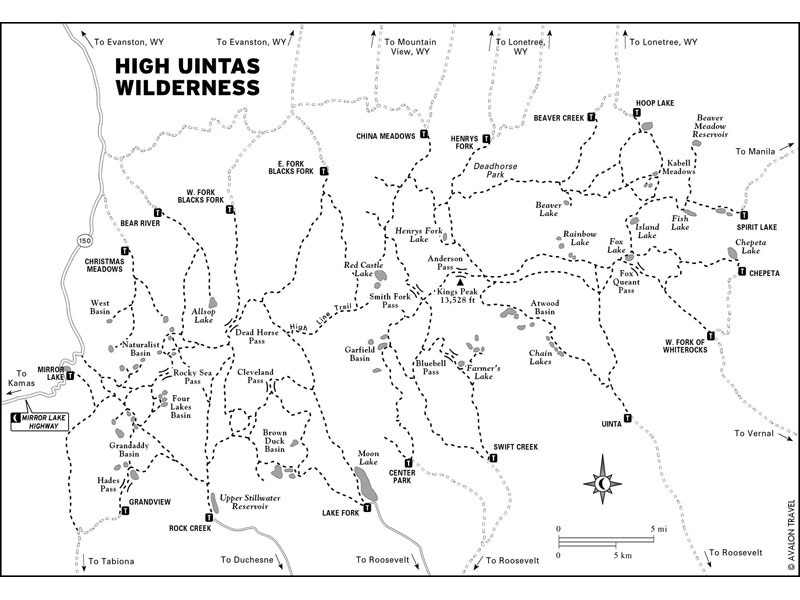 Also featured in the Uintas is the largest continuous area above treeline anywhere in the continuous US. Flat, high alpine basins filled with wildflowers and lush tundra reach over a few square miles in size and sit above treeline making for large amounts of treeless terrain. This is a very special place to spend a long backpacking trip and the fishing in many of the 2,000 alpine lakes in the range is incredible! This is also the place to see elk, moose, and other big game. The range can be divided into two main sections which are the eastern half and western half. The east half is characterized by very gentle but high peaks receiving less precipitation. The north sides of each peak are usually cliffs but cross country travel is typically simple however the talus is brutal to walk on since it erodes into piles of flat rocks that like to topple on one another making everything very loose. Having firm snow covering the talus slopes will help immensely. 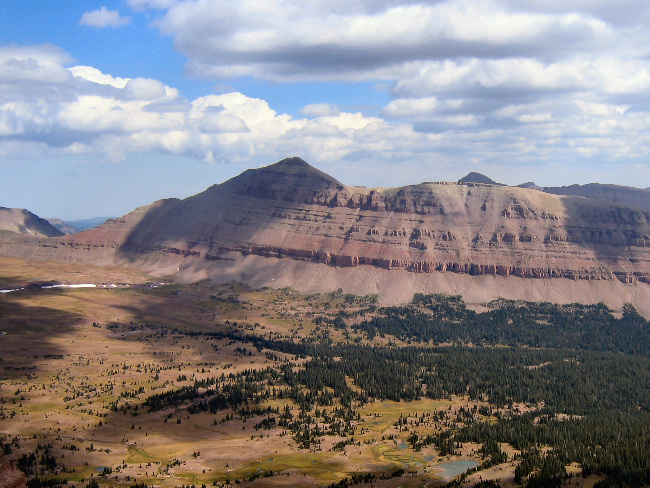 The highest peak in Utah, Kings Peak, is in this section and is also surrounded by many other nearby high 13ers. The western half is more rugged and received more winter snowfall making the high basins more lush and the lakes more colorful. There are only a few 13ers in this section though with the Lovenia massif capping the region. Some people say East Lovenia is the hardest of the Utah 13ers which requires stiff scrambling to reach its tiny summit. The Red Castle area is known to be incredibly rugged and it was only in recent yearts that Red Castle Peak, a 12er in the area, received its first ascent. The Uinta Mountains are known for their LONG approaches as much of the range lies within the 450,000 acre High Uintas Wilderness. It isn't uncommon to hike over 15 miles of trail just to get to camp! Although snow makes travel easier above treeline, for those trying to avoid it the earliest time you would want to go is mid-July. Typically the snow is not much of an issue then but the mosquitoes can be horrible and you may have to deal with many boggy areas in the high basins where water takes forever to drain out from. Weather here is very fickle and in winter it is always windy and due to the length of the approaches couples by trails being inaccessible, treks here in the heart of winter are rare. People that do venture here in winter do so on skis. Summer can be warm but afternoon thunderstorms can dampen your day or endanger you if you are high on a ridgecrest during a lightning storm. It is interesting to note the structural geology of the range. See the cross section below and make your own interpretations on how this beautiful mountain range formed. The left side shows the area to the south and the Uinta Basin where Vernal and Neola are located while the right side shows the Green River Basin where Rock Springs is located. Both of these basins hold large amounts of unconventional oil and oil shale reserves. The Uinta Mountains are located east of the Wasatch front which are the mountains rising above the Utah Valley and Salt Lake City. The skiing and world class snow known in the Wasatch Mountains is non existent in the Uinas since no ski resorts are found here. 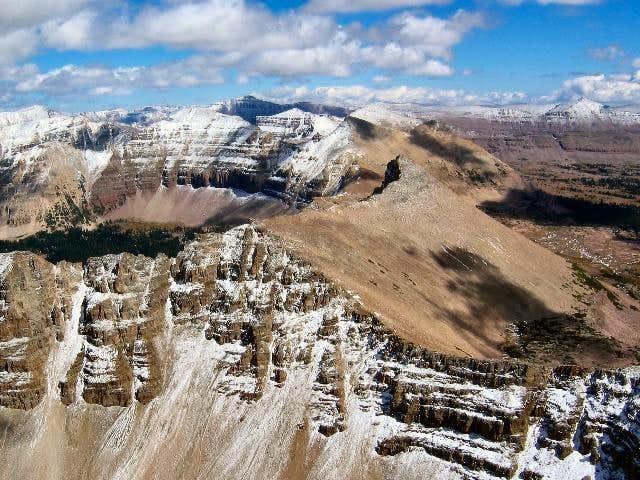 This is Utah's only true wilderness mountain range and the only road providing a glimpse into the high peaks is the Mirror Lake Scenic Byway which heads east and north from Kamas, Utah up over 10,687 foot Bald Mountain Pass passing by the picturesque Mirror Lake enroute. It then descends north to the Wyoming border for a total of 55 miles. Using the 300 foot prominence rule (meaning a peak must rise at least 300 feet above the highest saddle connecting it to a higher peak), there are 17 13,000 foot ranked peaks in the Uinta Mountains listed to the left. Scott originally made this table but I edited it to reflect the 300 foot prominence rule. There are a few other peaks in the range that rise above 13,000 feet but don't rise 300 feet above their respective key saddles. Click on the link for each peak to see more information about each one.